"Are you dead or are you sleepin'? God I sure hope you are dead"
Nat "King" Cole 45 vinyl; Answer Me, My Love / Why? 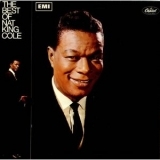 Sorry, no matches on iTunes for "Answer Me, My Love nat cole".